At WORLD electronics, we realize that once our circuit boards have been sent out into the world, our service does not end. As such, we offer a comprehensive and affordable rework service for our clients. What is electronic component rework? Electronic component rework is the analysis and repair of non-functional PCBs. While a large number of products fail because of excessive use and wear over a long timeframe, some fail at this point because of a failed connection or broken component. WORLD offers a rework service where a PCB can be returned, analyzed and repaired. Because of our approach towards procurement and warehousing, WORLD, at all times, has essential components on hand so any repair can be carried out quickly and efficiently, with a minimum of costs incurred. This procurement takes place during the initial design and manufacture process so that every client is able to draw upon our reserves and utilize our rework services should the need arise. In the event of a repair becoming necessary, WORLD’s engineers draw on their experience, in addition to over a million dollars’ worth of automatic test and repair equipment to offer fast and flexible repair services. This is yet another benefit enjoyed by WORLD electronics’ clients: WORLD can address all of their PCB needs. How does WORLD electronics rework electronic components? If the fault can be repaired, our technicians will do so. This may involve the electrical connection to the circuit being rerouted using new bonding. If it becomes necessary to replace a certain parts of the PCB, our engineers will detach it and replace it. Any solder from remaining on the pads post-removal will be removed. After a new component is attached, it will be placed as per exact specifications and the solder reflowed. 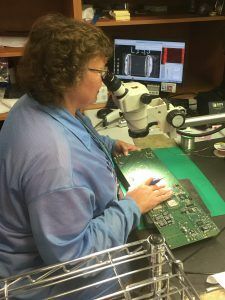 Our talented technicians can identify and repair PCBs using state of the art equipment, such as our AOI and X-ray Inspection machines, which can identify faults without the need for extensive and time-costly analysis. An AOI (or Automated Optical Inspection) machine performs a visual inspection of each PCB needing repair, immediately identifying any physical defect with the board. While this process used to be subject to human error, an AOI machine ensures accuracy and efficiency during the identification of faults. If you choose to use our rework service, the process is as follows. Every board that we receive is serialized and tracked by our in-house, custom ERP system; its serial number is kept on record, along with information about its manufacture and if or when it was previously processed by our reworking department. This further reduces both cost and timescale for our repair service, since previous information about a fault can often lead to a faster diagnostic check. After a PCB has been reworked, it will be returned with a problem report documenting the cause of the fault and what has been done to bring it back to working condition. This is so that our clients can understand both what caused the error on their PCB, and what WORLD electronics has done. This transparency underlines the efficacy and value that our repair service provides to our clients. WORLD offers innovative solutions for nearly every kind of electronic rework, including the latest advanced packages (BGA, QFP, CSP, 0201, etc.) As a rule, we can rework any PCB that we originally manufactured; our specifications can be found on our Literature Downloads page.